As an immigrant who moved to the United States in the fall of 2005, Wei-Hann Chen is now exploring and experiencing his new life journey on the Big Island. A city boy who grew up in Taiwan, Wei-Hann was born and raised in Taipei, where he graduated in 2005 from a high school with a specially-designed fine arts program. 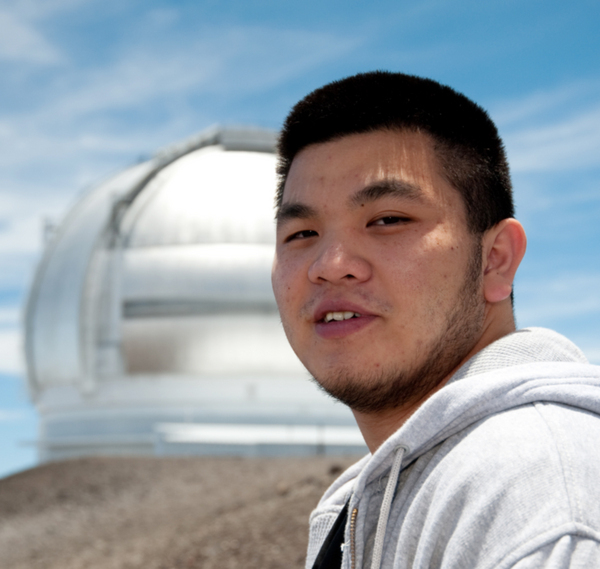 Currently a junior-year Mathematics major at the University of Hawai‘i at Hilo, Wei-Hann plans to transfer to UH M?noa in fall 2009 for further study and to add a second major in Mechanical Engineering. He is an enthusiastic beginner in his field, and he has been looking forward to better determining his future path through an Akamai internship. What makes stars twinkle? Convective turbulence in the Earth’s atmosphere causes fluctuations in the refractive index of the air. This randomly bends the path of incoming starlight, causing degradation of the quality of astronomical images, also known as “seeing.” Astronomers divide seeing into two regimes: natural atmospheric seeing and self-induced (man-made) seeing. The objective of this project is to understand self-induced seeing at Gemini, and to make recommendations to Gemini on how to improve it. Analysis of Gemini South (GS) Differential Image Motion Monitor (DIMM) data gives purely natural atmospheric seeing, while data from the GS on-instrument wave-front sensor (OIWFS) provide the total seeing. By taking the difference of these two values, I obtained the self-induced, man-made component of the seeing. Astronomical engineers identify three main sources of self-induced seeing: mirror seeing, dome seeing, and enclosure seeing. In each case, the magnitude of the seeing is a function of the temperature difference between the object and the surrounding air. In order to quantify these three sources of self-induced seeing, I analyzed GS temperature data and searched for correlations between seeing quality and thermal conditions. Unfortunately, sparse and/or missing data, due to insufficient and/or inactive sensors, adversely affected the process and prevented a complete analysis. Hence, fortifying the GS sensor array is one of my primary recommendations for the future. Finally, as part of my engineering study, I researched Gemini’s scientific requirements and “error budget” to determine constraints on image quality, and I studied prior engineering strategies that were implemented to reduce self-induced seeing.